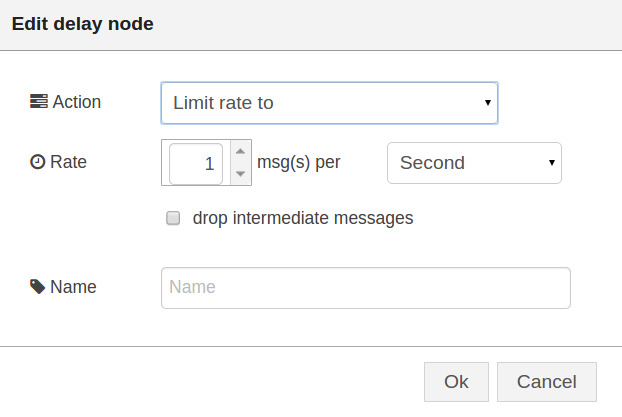 Example 5.2 in Lecture 5 demonstrated how to set up and send messages on multiple output nodes. This example shows how to send multiple message, but on the same output, from a single function node. One common scenario is a function node batch processing some data, with the following nodes wanting to have processed data as soon as it becomes available. Another common scenario is the creation of nodes that in turn create counters or pulses to actuate relays. Edit the function node and add the following code (See Fig. 6.29). This code is quite simple; it contains a loop that calls “node.send” 5 times. 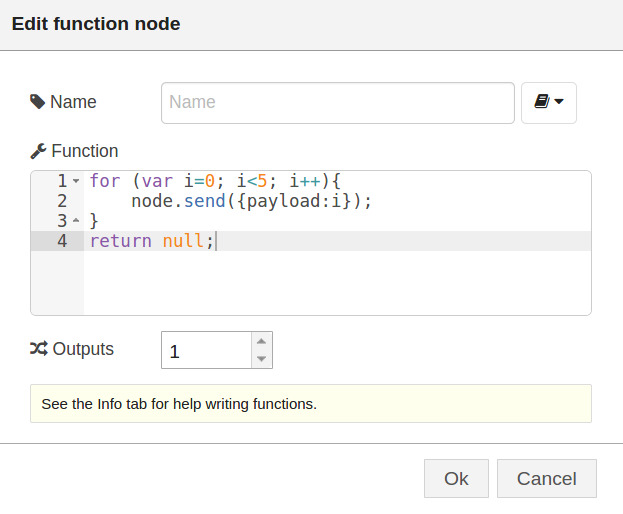 node.send was introduced in Lecture 5 at the end of example 5.2. It allows a function node to output messages to its output independently of its return value. Note how the function itself returns null. The expected output of this function will be a series of messages with the payloads: 0,1,2,3 and 4. To make the example ressemble a counter more closely, you can edit the delay node and configure it to limit the rate of messages to 1 per second, as shown in Fig 6.30.